I remember buying my first house. I didn’t even consider the property taxes when I wrote the offer. I assumed that they are what they are, and I can’t change that. What I didn’t take into account, is the long term impact of paying property taxes. In this post, I’d like to talk about why property taxes matter and how they affect the your personal finances. Let me start by giving some background. The first home I bought was actually a three unit building in San Francisco. I paid $336,000 for it and it the property taxes were determined based on the actual sales price. Because I asked for cash back in my offer, the net purchase price was a little lower. In California, the property taxes were 1.16%, so my taxes were about $3,800 per year. That’s $316 per month. The mortgage on the same property was $1765. You can see that the property taxes were 17.9% of the mortgage. Now California has a law that says property taxes can only increase by a portion of the CPI, or inflation rate. That means that your property taxes are basically locked in at the time of your purchase. It also means that people that have owned their houses for 30 years are paying next to nothing. For example, many houses that are going for over a million dollars have property tax bills of only one or two thousand dollars per year. For me, it meant that my property tax bill didn’t increase during the time I owned the property. After five years, I sold the three units for $730,000. At that point, my property taxes were only 0.5% of my property value. As you can see, the effect of property taxes in California, mostly because of poor regulation, are not that big of an issue. This is useful information to know if you are buying a house in California. Now that I live in Wisconsin, things are different. First of all, I knew property taxes were higher here, but I didn’t know the effect that they can have over the long run. I want to make two points here that are imminent in making good financial decisions when choosing where to buy a house. The first point I want to make is that property taxes continue to rise over the time that you own your house. We bought a vacation property about four years ago in Sauk County Wisconsin. We purchased the house for $250,000, and the annual taxes were $3,000, which was based on an assessed value of $280,000. I figured the property taxes would actually come down after the sale. What happened was that we did some remodeling that took about three years. One big project and a few small ones. We needed building permits to do the work. This triggered a new assessment each year. The first year, the assessors came out and I made the case that the property should be assessed at the price I paid for it. They ignored me and actually increased the assessment to $290,000. That year, we spent about $40,000 on improvements. They came and assessed it again. 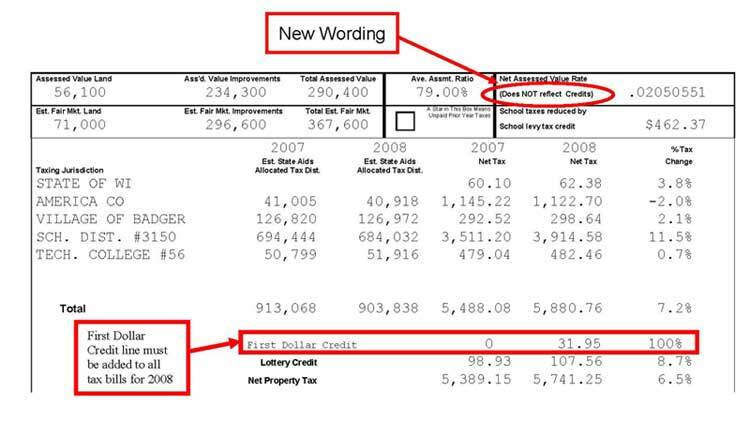 My logic was that I paid $250,000 and added $40,000, so the assessed value should be $290,000. They raised it another $30,000. And then another $20,000 the next year. Each year that the property taxes were raised, my monthly real estate tax climbed. Whereas the mortgage on the property is $900, the real estate taxes started at 28% of the mortgage cost. With all of the increases levied, the property tax on our vacation home has now doubled in just four years. That makes the monthly property tax now 80% of our mortgage amount! This is absolutely ridiculous, but contesting it has done nothing to lower it. And when the valuation doesn’t go up, the mill rate does. The point to take away from this is that you can plan to buy a cheap vacation home that you will hold for a long time. And while you look at the mortgage and say “it’s fixed” and I can easily afford $900 a month. When you take the tax burden into account, that $900 can easily grow to double that. And this is an expense that needs to be paid every year and that is never going to decrease. In my opinion, I am throwing money away that I pay on property taxes. I don’t use the schools on the vacation home and I hardly use any amenitites there. I royally feel like I am getting screwed and I’m hoping that by sharing this you can do your research and not fall into the same trap. Runaway government spending and high tax states like Wisconsin are not good places to buy real estate. You end up losing most of the value of your house to property taxes. That’s one of the main reasons that housing prices are much higher in low property costs states like California. This brings us to the next takeaway. Another important point to know is that your property tax bill will never go down, at least not substantially, even when the housing market is absolutely tanking. To illustrate, the vacation property we bought above has fallen in value by at least 40% over the past two years. In those same two years, our property taxes have gone up by 20%! This is absolutely ludicrous! The same thing has happened to our primary home. Our property tax bill is 10% higher over the past three years and our house value has fallen by at least 40%. The fact is that, during bad times, the government doesn’t slow their spending. And at the same time, they lose some support from the federal government, so they actually need to charge more. The takeaway here is that you should factor this effect into any home purchase or real estate investment scenarios that you are contemplating. If at all possible, find low cost real estate taxes before you buy. If you don’t, these costs are going to continue to eat up your budget over the years. Just think what this can do to your finances during retirement. Even when your mortgage is paid off, you’ll still have rising living costs. And at the worst times, these costs will still rise. I know I’ve painted a pretty dire picture here of why property taxes matter and how they’ve negatively affected me. Maybe you’ve had a similar experience, or even a favorable experience that you want to share? Leave us a comment. Sharing your experienced makes many things for me to understand about property taxes and its importance. What I like most is the idea of searching for best property that offers low cost taxes. This will really help me a lot as I am planning to buy a condominium as my first investment. I think property taxes matter a lot, in general. But I also think they matter even more in California. There are some places in California that have lower property tax but from my experience, most places in the state have high property tax. Park City Utah, for instance, usually has lower property tax and also lower income tax. I agree that in the long run taxes will it up your investment and should consider the rates of taxes before investing. Properties in some areas are frequently reassessed and get tax higher. Very good article with some conventional wisdom. It all really depends on the laws of the specific state that you live in…best to know what they are before you purchase the house…a lot of people won’t think to factor the tax into their monthly payment for a property. Previous post: Are Unions Good or Bad for the Economy?